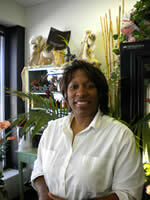 Park Forest, IL–(ENEWSPF)– Design’d to Go Florist is a family owned business located in downtown Park Forest. Owned and operated by Cathy and Michael Shears, the company is a member of Teleflora. “At Design’d to Go we are committed to offering only the finest floral arrangements and gifts, backed by service that is friendly and prompt,” said Cathy Shears. Originally located in downtown Chicago at the Chicago Club Building for 13 years, the company relocated to the south suburbs about three years ago, and recently celebrated its second year anniversary at the current location, 323 Main Street. It is the only flora company in the Village. In addition to general floral services, specialty services include tropicals, silk and dried floral arrangements, plants, gourmet and fruit baskets, permanent botanicals, and gift baskets. All floral arrangements are artistically hand-arranged and hand-delivered in a keepsake vase. Design’d to Go has a new unique entertaining and education program developed to teach the appreciation of flowers. These interactive activities may be held at children birthday parties, homes, child care centers and schools. Flower parties and demonstrations are available for all ages. Design’d to Go is currently seeking new residential and corporate accounts. For more information or to schedule an appointment, call Cathy at (708) 283-0900.